Love this game. It is such an interesting idea. Made 30+ maps for the Workshop. Have around 200 favorite maps to play on the Workshop. No love for F-Zero? Just a random topic about F-Zero: Nintendo's other racing game that is more about speed than Mario Kart's party races. Most likely, I may never get these two remaining pieces officially. And it works! I hacked it! I know it will get in the way of motion controls but I don't play much games that require it these days. I still have Super Mario Galaxy for example but I don't play it much. Plus the adapter is attached to a broken IR sensor Wii Remote so I don't care. I posted that over two years ago [here]. The problem is that they were 7 years too late! 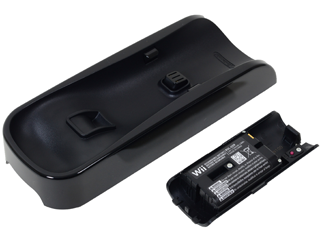 Nintendo DS came before the Wii and it came with a rechargeable battery pack so why not Wii? I HATE fiddling around with AA batteries! You want to know how much money and time I wasted just to find an acceptable 3rd party? I bought a NYKO Charge Station and it's a piece of garbage! It's the best I could find at the time. I'm OK with the black only variety. I don't care as long as it works! I've always put more money down on 1st party accessories than 3rd party because of quality control. I do think the price for one battery pack with charger is a bit costly. I think it's worth $20. Buying four of these should be $80 and not $160 which would be more competitive with the $50 NYKO Charge Station Quad.